by Cecilia Voss, First year student, MPhil Textile Conservation. During the first year we learn about the process of wet cleaning through the treatment of both a white and coloured object. 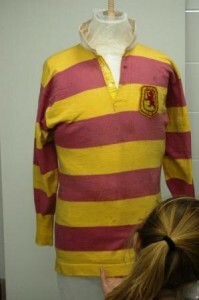 For my coloured object I was delighted to work on a Scotland football shirt from 1906. However, the decision to wet clean this shirt was not all that simple. 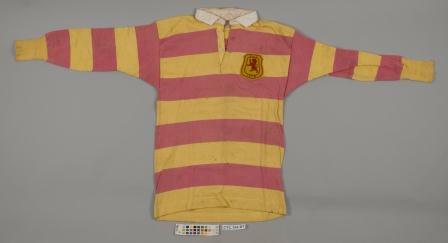 The front of the shirt before treatment © University of Glasgow. The cotton jersey football shirt had been worn by Alexander Smith in the match against England in 1906. Scotland won. The colours are Lord Roseberry’s racing colours, the patron of the team at the time and interestingly are being re-used for Scotland’s away kit in the 2016 European Cup qualifiers . The Scottish Football Association is also looking to revive the Scotland vs England match, the world’s oldest international football fixture. The shirt remains in the family. The shirt arrived at the Centre with the usual creases and dust particles from having been folded for a long time. However, it also had some other types of soiling which raised ethical issues as they showed evidence of use. 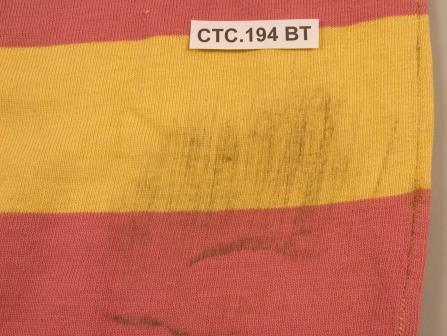 Around the collar there was some yellow staining probably caused by sweat which appeared fairly ingrained. The most interesting stain was on the back of the shirt. It was a large mud skid that looked exactly as though it had been caused by Alexander Smith sliding on the ground during the match. We had learnt about the importance of evidential soiling in our first semester. Case studies of previous conservation treatments showed the potential value of soiling. For example, one where a large amount of mud on military uniforms had been retained out of respect for the men who wore them on the battle field and the retention of saliva on the veil worn by Joseph Merrick, ‘the elephant man’ which, upon the extraction of the DNA, could reveal important information. Both these case studies seemed pertinent to the treatment of this shirt and inspired me to consider what ‘value’ the soiling held: what story did it tell and how important was it to the significance of the object and should the soiling be preserved? In order to determine whether the staining on the collar might hold DNA information, I looked at the shirt under ultra-violet light. Bodily fluids tend to fluoresce under UV, so I wanted to determine whether the shirt might still hold this kind of evidence. In the UV light the shirt did fluoresce at the collar and under the armpits as expected. However, on further research I found that the decay rate of DNA meant that most of it would no longer be present and moreover it would most likely have been contaminated by handling over the years. Finally, most importantly, there was no need to retain DNA when a living descendent was the owner of the shirt. The mud stain, however, was more important to consider. It had not decayed and still presented firm evidence of function. However, testing showed that that soiled areas had a much higher level of acidity than un-soiled areas and that in the long term this may cause damage to the shirt. In discussion with the client it became clear that the long term preservation of the object was of principle concern and therefore it was decided to proceed with wet cleaning. 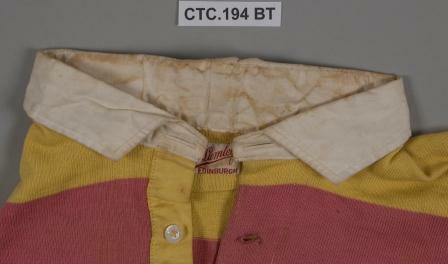 The shirt was washed in a conservation grade detergent and then dried on a mannequin as seen in the images below (Copyright@University of Glasgow). This balanced the pH and removed the creasing from storage. The best consequence of this cleaning, however, was that not all soiling was removed. 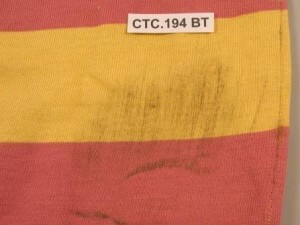 The collar did become cleaner but there are still traces of yellow staining and some of the mud stain, although now diminished, remains evident. As a result, the client’s wishes for the shirt’s long-term preservation were fulfilled and the evidential soiling which is an important part of its history was retained for the future generations to see. Excellent work by Cecilia Voss. I appreciate the clear written and concise report.